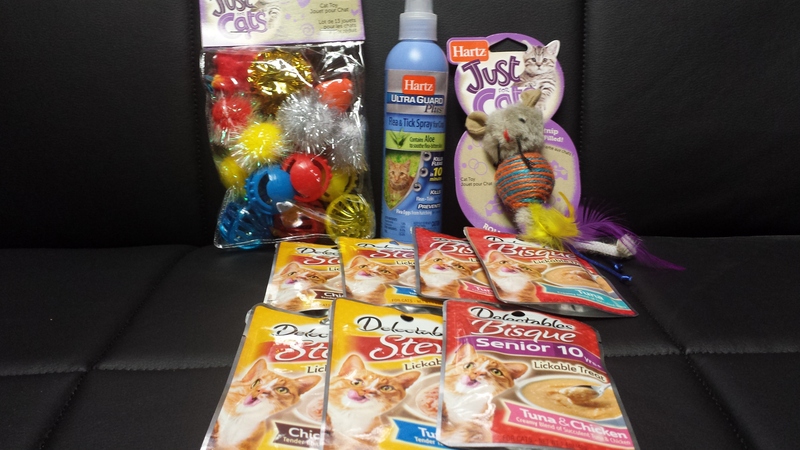 I have brought you some Pawsome products from a company called Hartz and boy do they love their pets and to prove it they have been making pet products for 80 years. I’m lucky enough to get to try some of their products and to share with you all. At Hartz®, our passion for pets all began in 1926, when Max and Gustav Stern came to America with 5,000 singing canaries. Th…e canaries, called the Harz Roller, came from the Upper Harz Mountain region (somebody along the way added a “t”). Eventually they started selling food for the birds as well. As time went on, Hartz®, added hamster food and tropical fish to their pet supply line along with many more helpful pet products. Hartz® actually became the first company to create pet supply departments in supermarkets across the country. Today, we take careful care of your pet with everything from Hartz® UltraGuard® flea and tick products, to our dog biscuits & cat treats to our full line of pet toys to round out our selection of pet supplies. But there passion for quality pet supplies doesn’t end with providing for pet parents. Here at Hartz, they are pet people in every way. If you visited there offices you’d see many of there employees bring there own pets to work. There is Jen, who’s often joined by Bosco, a Chihuahua with a serious overbite, Mirella and her bearded dragon, Ki-Lan and Sue, who is normally followed by her lovable mini Schnauzer, Daisy, not to mention many, many more. You’d also find veterinarians, pet nutritionists, entomologists, reptologists, experts in pet play, and all sorts of incredible specialists working together. We’re all constantly researching new ways to help pet’s live happier, healthier lives – and to connect them with the families who love them. Here are just a few of the products they make and I can tell you that the new Food called Delectables by Hartz is so delicious . I love every flavor! They even have a Senior 10+ food for older cats that might have a harder time to eat regular size morsels that the Senior 10+ is made very soft and easy to eat. You can find the Delectables at any grocery store. Now that I have told you about Hartz the company and about the new food Delectables let’s get to most important things, like the Toys!! Purr. Purr. Here is one of the ball called a Bell Mouse that I love to play with and even take it outside. I just can’t help myself playing and rolling around with the Bell Mouse Ball. It has ears and a tail like a mouse, sorry you can’t see it in this photo, but all I can say is It’s a lot of Fun! Your kitty might even Love the Bizzy Ball to play with by Hartz. They offer over 1,500 products (more are breeding all the time! ), with products catered to dogs, cats, parakeets, canaries, parrots, cockatiels, finches, goldfish, tropical fish, reptiles, ferrets, chinchillas, guinea pigs, hamsters and rabbits. Hartz makes a Flea and Tick Control spray to help protect me outside. Do you see a fish next to my head or am I just imaging it? Okay, I’m not imaging the fish by my head. There is a fish hanging from the window by my cat tree. Umm..
Wheww,,, I’m so happy that I wasn’t imaging the fish but I found out that this is a new toy by Hartz called Gone Fishing. It is an interactive toy that will provide hours of fun for you and your cat. The sparkly catnip filled fish is attached to the end of a versatile wand that can be used to tease your cat during playtime or can be suctioned to any hard surface. The elastic string causes erratic movements to make your cat pounce for added play value. What can I say…” Hartz has my Heart”, by making pet products that I Love and with Hartz around I don’t need anything else! If you would love to check out some of the products by Hartz follow the link below, but don’t forget to leave me a message love to hear from you all. This entry was posted in Accessory, Angel's Eyes, Grooming & Care, Product Reviews, Toys and tagged cat, cats, cute, katze, katzen, kawaii, pets, ねこ, ﾈｺ, 猫.
That’s amazing and what great birds to help save lives. Thanks for sharing this. A cat can’t ever have enough toys! I totally agree it’s great excerise and adventure to add to there day.